Annually, the Big League Experience hosts tournaments on back to back weekends in April featuring close to 50 different teams from the West Coast to the Prairies. For 2018, the “Best of the West Tournament Series” will be held on April 5-8 and April 12-15 weekends. Hosted in Kamloops, BC on the pristine McArthur Island baseball complex, the area and environment are second to none. Not only are the BOW Tournaments a great way to kick off your season, the games are highly scouted especially during the Showcase Weekend. We look forward to seeing all the participating teams gather on McArthur Island and enjoy the baseball, networking and conversations to be had! Thanks in advance to the Kamloops Parks and Recreation Staff and TRU Wolfpack baseball for having the fields ready to go for every game! Twenty-four teams from throughout B.C. and Alberta participated in two divisions (Midget-14 and Bantam-10) in Kamloops, B.C. over the April 6 – 9th weekend for a competitive pre-season tournament. Outside of the rain during the initial morning of games, the weather cooperated and allowed us to play a full slate for the weekend. As usual, the Parks and Recreation staff did a great job in having the fields ready to go for every game. With only the top team in each Pod moving on into the playoff round, every game played in round robin action was important. Once the dust settled, it was the North Shore Twins ending up as the #1 seed in round robin play, matching up against the Chilliwack Cougars in what may have been the game of the tournament. 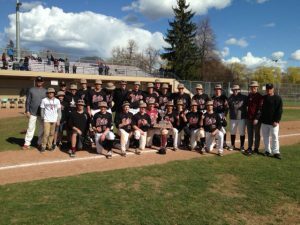 It went 11 innings and the teams played for over three hours before Chilliwack defeated the Twins 4 – 3. In the other semifinal, it was the Okotoks Dawgs coming from behind to defeat the Calgary Dinos in another well fought game. 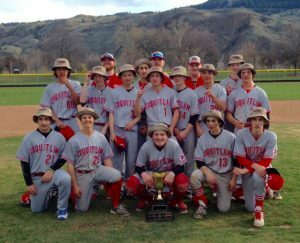 This set up the championship game that had Okotoks get the W and the photo op with the trophy and the coveted bucket hats! Check out photos of the BOW Series on our Facebook Page! s strong and saw the #1 seed North Shore Twins along with the Calgary Jr. Dinos, White Rock Tritons and Kamloops River Dogs move on into the playoff round – all other teams played a consolation game. 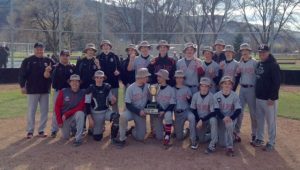 Once said and done, it was a very good North Shore Twins Bantam Prep team defeating the River Dogs of Kamloops in a well fought affair. With 22 teams heading into Kamloops for Easter weekend, BLE was onto its second leg of the Tournament Series. Starting a day earlier then the previous week, the tournament ended on Saturday allowing families to be together for Easter Sunday! 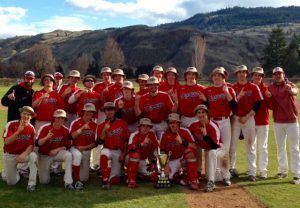 Next up in the BOW Tournament Series was the Premier Showcase, taking place from April 12-15th in Kamloops, BC. With 5 teams from the PBL in BC and 5 from top tier academies in Alberta, the competition was of high caliber. Watching the talented pool of players were Scouts representing 15 MLB teams, Coaches of 12 colleges ranging from the CCBC to Indian Hills in Iowa and Recruiters of T12 put on by the Toronto Blue Jays in cooperation with Baseball Canada at the Rogers Center. oks) was 0-0 heading into the 6th before Vauxhall scored 4 runs and never looked back! In qualifying action, White Rock defeated the Edmonton Prospects and Victoria defeated Coquitlam, securing automatic bids to BOW 2018. For the teams that we’re not able to automatically qualify, the Fall BOW is scheduled for Sept 22-24 in Kamloops, BC. Coinciding with the Showcase tournament was the Bantam Prep/AAA competition. With 3 Albertan, 5 PBL Prep and 4 BC Minor teams, the weekend was a great mixture of competition through varying levels of play. McArthur Island is setup in such a way that many of the younger players were exposed to the Showcase Tournament Scouts/Coaches/Recruiters, creating an amazing environment! The 12 teams were broken up in 3 Pods, starting play on Thursday heading to the finale on Saturday. After round robin play, Coquitlam and Okanagan made a semifinal, while Cloverdale and Okotoks made the other. Coquitlam and Okotoks advanced, with Coquitlam winning a nailbiter to secure the championship and the bucket hats! THANKS TO EVERYONE WHO ATTENDED THE “BEST OF THE WEST TOURNAMENT SERIES” AND WE LOOK FORWARD TO SEEING YOUR TEAMS PARTICIPATE IN THE FUTURE!!! GOOD LUCK THIS SEASON FROM THE BLE! !